Michael Matthews is a prolific writer, and in July last year he updated his book Bigger Leaner Stronger to version 2.1, introducing the concept of a "Strength Week" every 4 weeks. 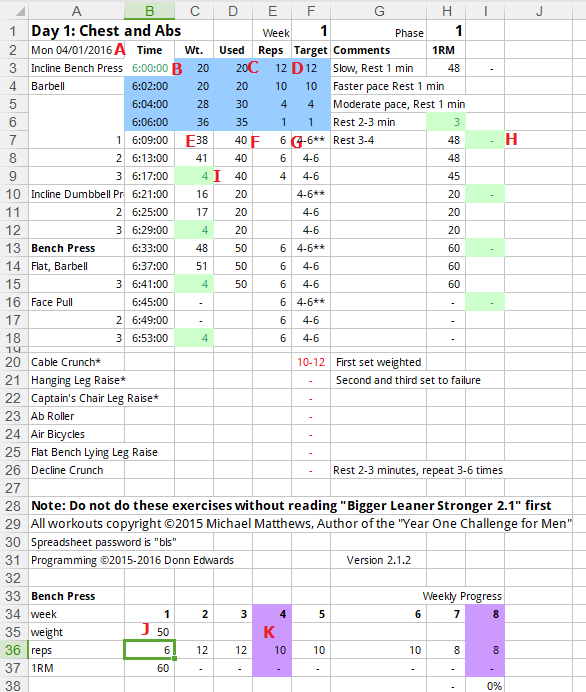 For those of you who don't know, I have made a series of spreadsheets that follow the Bigger Leaner Stronger Year One Challenge program. These can be found at http://www.fact-reviews.com/bls. I have now finally updated my website with the new spreadsheets. They cover all 6 phases (each phase is 8 weeks, followed by 1 week rest) for each of the 5-day, 4-day and 3-day per week programs. The idea is that you create a shared dropbox folder on your PC and your phone. Then you store the current phase spreadsheet in this folder, so you can update it on your phone while you are at they gym, between sets. On my Android phone I use WPS Office, a free program that is compatible with Microsoft Office. It uses the .xls format, not the newer (and larger) .xlsx format, so this reduces the file size, and the data usage when you update it on Dropbox. I'm sure there are IOS apps that can edit these files too. Then when you get home from the gym you can print out the page of today's exercises, and keep a record of your progress. There is also space at the bottom of each page where you can keep track of your progress over the 8 week period. I find that this helps me monitor my improvements over time, which encourages me to improve, even by a small amount each week. I started the Year One Challenge two years ago, and am now on phase 5 week 3. This is partly because I started over after recovering from a repetitive strain injury, and also because I go to gym 3 days a week but do the 4-day program, to ensure that each Tuesday I am on a different day with my personal trainer. He helps me make sure my form is correct, so I don't waste my time or do anything stupid that might cause an injury. I thought South Africa was a screwed up country, but the greatest hypocrites on the planet have to be the USA. They even have the audacity to call themselves "Americans" to the exclusion of the remaining population of two continents, including such countries as Canada, Mexico, Brazil, Argentina, Chile and a dozen more. And every 16 years or so they elect a moron for 8 years, followed by a liar for another 8. And so it goes. In the supposed land of the free, visit https://www.battleforthenet.com for more information on how the USA is abusing the rights of its citizens.